SUMMARY: A patient with acute top of the basilar syndrome clinically was found to have only a small basilar artery filling defect but complete occlusion of the artery of Percheron. Intra-arterial thrombolysis resulted in favorable neurologic outcome. To our knowledge, this is the only case of angiographically proved and treated artery of Percheron occlusion. The value of this report is that reperfusion of ischemic areas was only achieved when persistent investigation disclosed artery of Percheron occlusion. The artery of Percheron is a solitary trunk representing an uncommon anatomic variant that provides bilateral arterial supply to the paramedian thalami and the rostral midbrain. Occlusion of this artery, therefore, results in bilateral thalamic and mesencephalic infarctions. 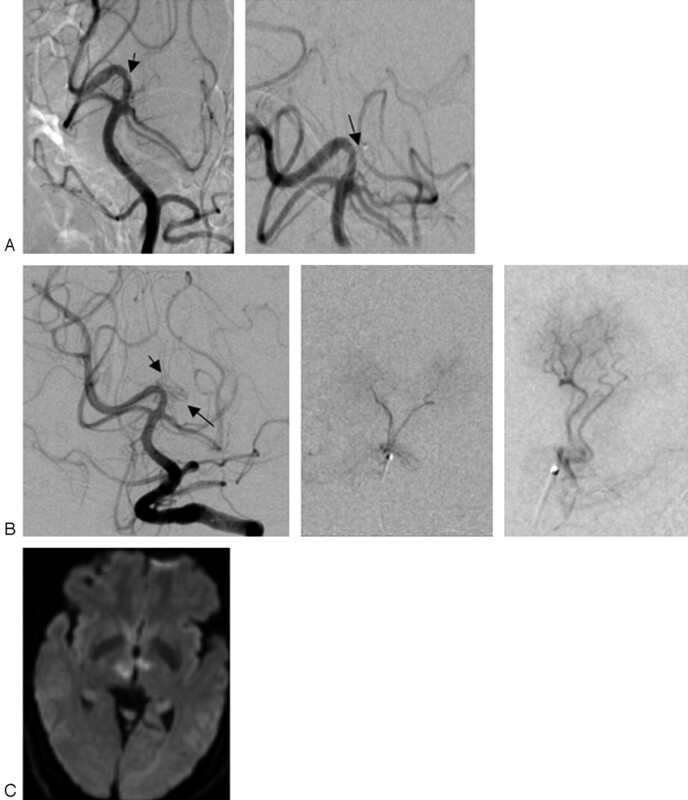 We describe a patient who presented with a syndrome of acute bilateral rostral brain stem stroke that was discovered on cerebral angiogram and subsequently successfully treated with selective intra-arterial thrombolysis of the artery of Percheron. Postprocedure neuroimaging confirmed clinical and angiographic diagnoses. The patient was a 69-year-old right-handed Hispanic woman, who was in good health until 4 pm on the day of admission, at which time she developed very sudden onset of blurry vision and dizziness, which after 10 minutes progressed to loss of consciousness. Paramedics were called, and she was brought to our emergency department, where blood glucose was found to be 89 mg/dL and Glasgow Coma Scale score was 5. No pertinent medical history was present, and the patient had been on no medications. The patient lives in Mexico and was visiting family in California. Initial head CT showed only mild atrophy, with no acute abnormalities. Initial electrocardiogram showed T wave inversion in inferior leads III and aVF, with normal serum creatinine kinase-MB fraction, and troponin. Basic chemistry and blood counts were unremarkable. Urinalysis was consistent with acute cystitis. A clinical diagnosis of cardiac ischemia producing embolus to the top of the basilar artery, affecting bilateral rostral brain stem, was made. The patient was transported emergently to the neurointerventional suite for cerebral angiography and endovascular treatment. On the vertebral cerebral angiogram, a small filling defect was seen in the area of the basilar artery tip/proximal P1 segment of right posterior cerebral artery; the left P1 segment was aplastic (Fig 1A). On the basis of a strong clinical suspicion of a substantial embolus to the basilar artery tip, this filling defect was explored. First, via the microcatheter, 5 mg of tissue plasminogen activator (tPA) was infused proximally from the clot; then by using a 0.014-inch microwire, the artery of Percheron was catheterized (Fig 1A). Super-selective thrombolysis was then performed with an additional 7 mg of tPA. Finally, complete recanalization of the artery of Percheron was achieved, with subsequent selective angiography showing a solitary artery of Percheron trunk with double branching distally (Fig 1B). A, Prethrombolysis. Left: The left vertebral artery angiogram shows a small filling defect (black arrow). The left P1 segment of the posterior cerebral artery is aplastic in this patient; thus, the defect could be either the basilar artery tip or the proximal-most right P1 segment. Right: Selective angiogram shows the microcatheter extending beyond the right P1 segment into the proximal lumen of the occluded artery of Percheron. Arrow indicates catheter tip. B, Post-thrombolysis. Left: The left vertebral artery angiogram shows normal visualization of the full length of the artery of Percheron (arrows) as does microcatheter selective angiograms of the artery of Percheron at center and right. The proximal occlusion of the artery of Percheron seen in Fig 1A is no longer present. C, DWI MR image obtained 24 hours after intervention shows minimal final ischemic injury. The patient was anticoagulated with intravenous heparin, with activated clotting time kept at 300–350 seconds. An MR image of the brain obtained 24 hours after the procedure demonstrated minimal residual stroke (Fig 1C) as well as petechial hemorrhage in the affected area. Repeat assessment of cardiac enzymes was consistent with myocardial infarction. During the ensuing week, many features of the neurologic examination improved. During this interval, the patient had resolution of stupor, diplopia, ptosis, internuclear ophthalmoplegia, gaze preference, and left-sided paresis. Residual deficits consisted of absence of upgaze and of downgaze and skew deviation. Percheron described possible variations involving the paramedian thalamic-mesencephalic arterial supply.2,3 Our patient demonstrated embolic occlusion of 1 of the less common variants, a common trunk arising from a P1 segment (ie, the artery of Percheron). The embolus was likely a consequence of cardiac embolism. The presentation of the current patient was typical of a vascular insult in this anatomic region.4 Patients with paramedian thalamic ischemia and infarction are often obtunded, comatose, or agitated, and they may or may not have associated hemiplegia or hemisensory loss. Occasionally, the cranial nerve III nucleus is involved, with a resultant ophthalmoplegia. Depending on clinical/anatomic variations, patients can present with different symptom complexes as a part of paramedian thalamic syndrome.3,5,6 Matheus and Castillo7 reported 3 MR imaging–confirmed cases of occlusion of the artery of Percheron, demonstrating symmetric thalamic and mesencephalic lesions typically seen in occlusion of that artery.8 Thus when findings in the setting of an acute ischemic stroke suggest top of the basilar artery syndrome but no such basilar artery occlusion is found, occlusion of an artery of Percheron should be considered. To our knowledge, this is only case of angiographically proved and treated acute occlusion of the artery of Percheron. The value of this report lies in the fact that angiography initially demonstrated only a partial arterial filling defect in the basilar artery, rather than any clear arterial occlusion, and that reperfusion of ischemic areas was only achieved when persistent investigation disclosed artery of Percheron occlusion. Thrombolysis of this occlusion was associated with a relatively favorable neurologic outcome. These findings suggest that a presentation of acute rostral brain stem stroke accompanied by bilateral medial thalamic infarcts, with no basilar artery occlusion, should increase suspicion for a diagnosis of and encourage interventional explorations focused on potential treatment of occlusion of the artery of Percheron. The Editorial Committee for the Guarantors of Brain. Aids to the Examination of the Peripheral Nervous System. London: Billiere Tindall,1986 .